Cobra Tech TM Inline test and soldering tool. A sealing apparatus is disclosed. In some embodiments, the sealing apparatus includes a shaft assembly that couples a laterally expandable plug and a longitudinally expandable member. The plug and the expandable member are captured within the ends of the shaft assembly. The shaft assembly is configures so that longitudinal expansion of the expandable member results in lateral expansion of the plug. Thus, such a device can be inserted into a pipe and the plug can be expanded within the pipe to provide a seal about the shaft assembly. In some embodiments, the shaft assembly can define a longitudinally extending hollow pathway that allows flow between the two ends of the shaft assembly. Examples of how such hollow pathway and the plug operation can be implemented are disclosed. Example applications, such as pressure measurements, are also disclosed. An item that test lines for pressure and or can be used for soldering. License with royalties, and or investors. Product has been in market for four years. and has shown a profit. currently only being sold in Southern California. National potential for plumbing, test labs, manufacturing, processing plants, maintenance facilities. 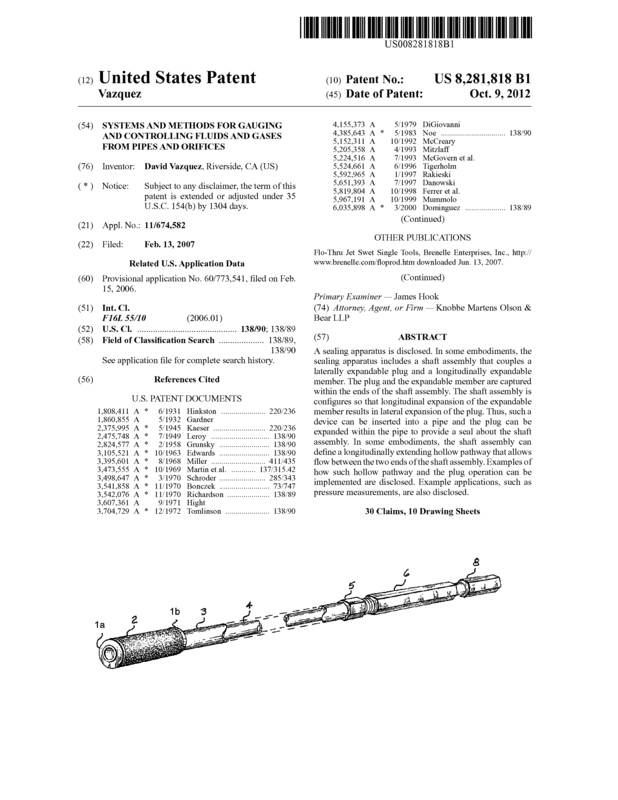 Page created at 2019-04-24 18:40:43, Patent Auction Time.